After you’ve closed the sale and received your commission, it’s tempting to think the job is over. It’s not! Now is your opportunity to set the tone for an ongoing relationship with your clients. Once you’ve proven yourself by closing a sale, you can start building a lifelong business relationship. This is your chance to position yourself as the go-to real estate expert, prompting your closed clients to comfortably send you referrals and ask you to represent them in their next purchase. Here are eight basic relationship builders used by top agents, all of which are actions you should take after the closing. Update your database. Your database will be one of your most important tools, so make sure it contains contact information about each of your clients. Make notes about your clients’ preferences and how they engage with their community. Are they foodies? Sports fans? What about hobbies? You should note kids’ names, schools, or other people who are important to them. Send a thoughtful closing gift. If your clients are buyers, you can send a closing gift to their new home with a personalized note. This shows your appreciation for their trust and business. Try to personalize the gift — perhaps a gift card to a local restaurant in their new neighborhood. If your clients were sellers, send something special to them, like a bottle of their favorite wine. Don’t send form letters with closing gifts — always send a personalized note. Check in on them after they close. Continue to show your closed clients that you care about them even after you have received your commission. Give them a call after they have lived in the home a few days to see how things are going. Checking in on them will help build trust. Ask for referrals. Referrals are the backbone of a strong real estate business, and you should ask your closed clients if they know anyone in need of an agent. Let closed clients know that you enjoyed working with them, and that if they know anyone who is looking to buy or sell, you will do a great job for anyone they refer. If you stay in touch in a friendly, professional and helpful manner, your business will grow and customers will come to you! Send a post-close survey. One great way to improve your business and build long-term relationships is to follow up with a survey. In your efforts to always do the best work you can, you should have the survey ready to go. Get a testimonial. Another relationship builder is asking for testimonials. While you’re still top of mind with your clients, ask them if they would give you an endorsement. A testimonial is just a few sentences about their experience working with you. Make a social connection. If you haven’t already done this, make a social networking connection. Use your Facebook business page to friend them, and post smart real estate-related items. Remember: This is NOT your personal page. It’s a chance to show your professional knowledge of the community while sharing news about your awards and successes. Stay in touch. Most importantly, use your good marketing practices to stay in touch with your closed clients. Send them cards, emails and neighborhood invitations to join you at community events, for example. Some agents even have client holiday parties and invite all of their past clients. A closing does not mark the end of the relationship. 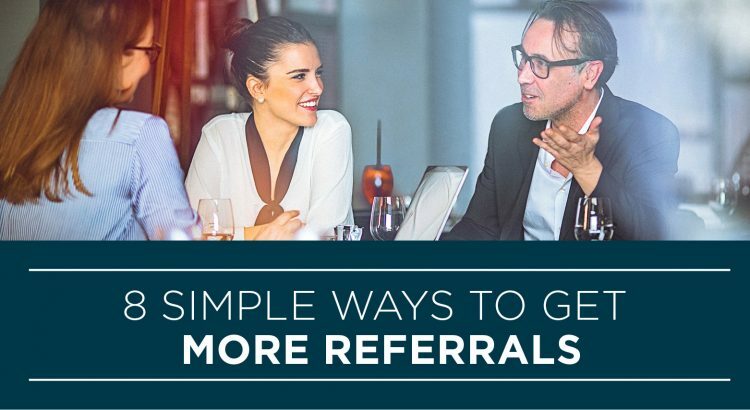 It’s an opportunity to set the tone for an ongoing relationship with your closed client and build your referral network. For more information on how to build your referral network, receive a seven-day free trial when you sign up at AgentEDU and view this course today.